I like a good moan as much as the next person, but one of my favourite things about Which? Conversation is that it gives us the chance to show examples of companies who get things right. Yesterday I went for dinner with my family at a really nice restaurant near Waterloo. Unfortunately, when we arrived at the restaurant they’d had an electrical problem, and consequently had to shut. Looking mournful, we turned to leave, at which point the small team that was left at the restaurant sprang into action. It turned out that they had another branch just round the corner, which had set up extra tables to make sure they didn’t disappoint diners. One of the waiters accompanied us to the restaurant, and settled us down at a table. It seemed a bit odd to be sitting at an extra table that was spilling into the café next door, which had stayed open to deal with the extra customers. Waiters and waitresses ran back and forth between the two buildings, juggling food orders, drinks, and strained-looking smiles. I was impressed with their can-do attitude, and it made us all feel well looked after. The restaurant hadn’t turned us away, but instead had done all it could to accommodate us, which was especially welcome given that it was a special birthday meal! Unfortunately, while we were busy praising the resourcefulness of staff, not all of our fellow diners were quite so pleased. There were mutterings and complaints from nearby tables, as people weren’t quite getting their food or drinks quickly enough. This would be understandable, I think, in a restaurant running a normal service, but I thought it was a bit unfair to make such loud and (on one notable occasion) rude complaints when it was clear that the staff were doing their best in the face of an unexpected problem. Although our food was quite late, the service was by no means bad given the circumstances. We resolved to wait patiently and avoided kicking up a stink. We were rewarded at the end with a delicious meal and a free dessert ‘for our patience’. Over the moon about free dessert (who wouldn’t be?) we thanked the waiter and congratulated him on being able to juggle so many extra customers. At the end of the meal he gave us a box of Turkish delight and thanked us again. What’s the moral of this story? Great customer service can work wonders, and you don’t always have to complain before they provide it. 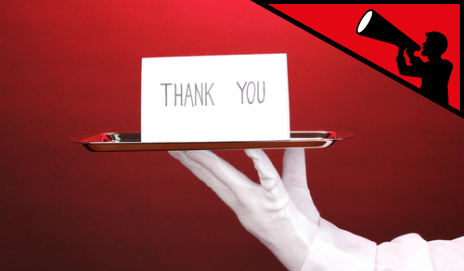 If a company (in this case a restaurant) knows that service might be a bit slow – thanking diners for their patience and giving them free dessert can mean that they be more likely to come back (as I certainly will!). Great customer service in response to a complaint is one thing, but how about going out of your way to help even if the customer isn’t making a fuss? Do you think that makes the difference between a good company and a great company? If you’ve been to a fantastic restaurant recently, why not nominate it for The Good Food Guide’s restaurant of the year award? Everyone who submits a nomination will be entered into a free prize draw for a meal for two at the regional winning restaurant most local to the winner. A restaurant hasn't kept my booking - can I claim compensation? This story reminds me of the course and accompanying book ‘A Complaint is a Gift’. In your case you were not complaining, but you were close to doing so. The course/book explains that when things go wrong the service provider is a) receiving actual rather than anecdotal information about the way their operation works b) has the opportunity to put it right and if done well, the initially upset customer will sing the praises of the service provider to all their friends – exactly the opposite behaviour expected when the event leading to the complaint occurred. My own story is of dining with a group of friends in a Wetherspoons pub in Islington. My meal arrived 10 minutes after that of my friends. The waitress apologised saying that it was the result of a temporary chef being unfamiliar with the kitchen. I was not too unhappy, it was a good meal and we were not going on anywhere. Ten minutes later the waitress was back. She had created a formal complaint on my behalf and received sanction from the pub manager to refund the cost of my meal, which she gave me. You can bet that I have since told ever one of my friends and colleagues about the Wetherspoons service. I love that warm glow I get after a company has made something easy for me – especially if I start out angry. A good recent example was audible.co.uk, an audio books service owned by Amazon. I had signed up for a free trial with them (linked to my Amazon account) and a couple of weeks later, without realising what I had signed up for, I had £7.99 taken from my account as a subscription fee. I was very annoyed! I rang them, ready to complain and fight for my £7.99. But the lovely lady on the phone simply promised an immediate refund, and that was all I had to do. I was delighted! I nominate a local branch of Kall Kwik, the printers, for good service and helpfulness. For example, they are happy to take files produced by a friend in Publisher ones pages produced by me in InDesign and put together a magazine for our charity. The dear old lady that used to edit and produce the magazine made life even harder for a different branch of Kall Kwik, but they always delivered a good product without question or criticism. In response to the article and regarding Turkish people and restaurants. I have always found them to be so very helpful and obliging. They value their customers and try to treat them well and supply the food they want even if it is not on the menu and they have to go elsewhere to get it. We all can understand the need and right to complain about products and services that do not meet our personal satisfaction standards. But, lately, I’ve noticed that even though we as humans tend to complain much faster than we praise, complaints have escalated dramatically. I’ve thought a lot about why this is happening and came up with a lot of reasons, but the primary ones appear to me to be one, the ease and speed with which we can now complain online. You should go for iRateiSlate. How can VW be held to account for the dieselgate scandal? Would you complain about a shoddy service or problematic product?